A comprehensive line of fast drying, aerosol paints that restore engines and other metallic parts to their original color. An easy-to-use, high gloss aerosol silicone spray that treats, shines and protects rubber, plastic and vinyl surfaces. It is weather resistant, non-greasy and dries instantly. A powerful, VOC compliant aerosol fabric cleaner that effectively removes both oil-and-water-based stains. It instantly removes grease, tar, coffee, cola, urine, polish, ink, lipstick and blood without scrubbing. An easy-to-use aerosol wax that produces deep gloss, provides lasting protection and features a pleasant tropical fragrance. It can be applied by hand or with a high speed or orbital buffer. Aerosol Cans A thick, highly concentrated, red, liquid soap featuring a thick, durable foam that lifts and holds dirt in suspension, a film-free rinsing action and a cherry fragrance. One Gallon A concentrated, red, heavy-duty, water-based, general purpose cleaner that is low foaming, highly alkaline and formulated for both exterior and interior use. Has cinnamon scent. A blue, VOC compliant, paste wax that removes minor paint imperfections, produces deep, rich gloss and provides lasting protection. It contains mild abrasives, silicone and carnauba wax. 1 quart tin A yellow, VOC compliant, paste wax that removes minor paint imperfection, production deep, rich gloss and provides lasting protection. It contains silicon and carnauba wax. 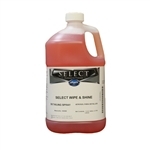 1 quart tin A highly concentrated, coral colored, liquid soap featuring a high stable foam that removes dirt and grime, and carnauba wax which provides excellent shine and maximum beading action. A colorless, concentrated, highly alkaline, water-based tire cleaner formulated to remove scuff marks, dirt, grease and road film from tires and whitewalls. VOC compliant and body shop-safe. 1 Gallon A mildly abrasive, gray clay bar that safely removes paint over spray and other containment's from painted, chrome and glass surfaces. A aggressive, purple clay bar that safely removes paint over spray and other containment's from painted, chrome and glass surfaces. Contains additional abrasives which simplify cleaning. A concentrated, blue, light-to medium-duty, water-based, general purpose cleaner that is citrus scented, features a high, penetrating foam and is formulated for both exterior and interior use. 1 Gallon A highly concentrated, VOC compliant, high foaming soap for the exterior surfaces of watercraft and RV’s. Its pH balanced formula, with enhanced surfactants and high foam clinging action, provides superior cleaning especially on vertical surfaces. The clinging foam lifts and holds dirt in suspension preventing scratching and re-depositing while providing a spot-free rinse. Plus, it is phosphate and NPE-free. Gallon. A milky white, ready-to-use, VOC compliant liquid that safely and effectively removes dirt & grime from leather surfaces, while replenishing the leather's natural oils. A colorless, medium-duty, ready-to-use, acid-based wheel cleaner formulated to safely clean and brighten all wheel types. Can be diluted 1:1. VOC compliant and body shop-safe. 1 Gallon A straw-colored, ready-to-use, VOC compliant, alkaline cleaner formulated to remove dirt and grime from interior leather and plastic surfaces. Features a pleasant citrus scent. 1 Gallon An extremely buffable, gray lotion that quickly removes heavy (up to 1200 grit) scratches, oxidation and orange peel from any painted surface. Ideal for high volume shops, it is VOC compliant, generates minimal buffing residue and features a spicy cinnamon fragrance. Only available in quarts. A VOC compliant, off-white lotion that eliminates moderate surface imperfections quickly and easily. Extra lubricants enable users to remove 1200-1500 grit scratches without swirling or excessive residue. It features a pleasant cake batter fragrance and requires minimal clean-up. Available in quart bottles. A banana scented, yellow lotion that quickly cleans any paint system with no swirl marks. It effectively removes light (1500-2000 grit_ scratches, blemishes and oxidation while generating a deep gloss. It stays "open" longer than most compounds, and is VOC compliant. Available in quart bottles. A body shop-safe, VOC compliant, purple polish that removes light scratches and swirl marks, and provides a protective barrier. Its thick, creamy formulation is extremely easy to apply and clean up, and its grape fragrance makes it a pleasure to use. Available in quart bottles. 1 Gallon Formerly Beetle Juice. Highly concentrated, VOC compliant, specialty cleaner formulated to remove insect residue form exterior paint, chrome and glass. 1 gallon. A purple, body shop-safe, VOC compliant, spray on-wipe off cleaner that removes dust, smudges and fingerprints from automotive finishes while generating gloss. Ready-to-use and features pleasant jasmine fragrance. SELECT Wipe & Shine is an easy-to-use, VOC compliant, spray on-wipe off express detailer that removes dust, smudges, and fingerprints from automotive finishes and generates a high gloss shine while providing UV protection to painted surfaces. Ready-to-use, do not add water. 1 Gal A thick, slow drying, ready-to-use gel containing oxalic acid that effectively removes metallic fallout particles embedded in painted surfaces. 1 Gallon A highly concentrated, VOC compliant, exterior cleaner formulated to remove black streaks, insect residue, road grime and light oxidation from the exterior surfaces of watercraft and RV’s. It’s a safe and effective pre-wash for cleaning painted aluminum, fiberglass gel coat and clear coat surface and is also excellent for chrome & glass surfaces. It is a water-based cleaner formulated from CleanGredients® surfactants and is solvent and glycol ether-free to reduce health and environmental impact and to eliminate the risk of damage to decals. Plus, it is phosphate and NPE-free. Gallon. A colorless, ready-to-use solvent that safely removes decal and label glue, undercoating and tar from painted and chrome surfaces. A colorless, multi-purpose solvent blend used to thin bulk engine paint. A colorless concentrated, VOC compliant, silicon-free spray wax/rinse aid formulated to shine vehicle surfaces and promote fast water shedding. Can be applied through a spray arch or spray bottle.